Semple grew up on a farm north of Regina, Saskatchewan. He started his musical career playing with various Regina-based bands, and later relocated to Toronto in the late 1980s to become the lead guitarist of The Lincolns, a popular funk and rhythm and blues band. He left the band after two years and returned to Regina to pursue a solo career and to spend more time with his family. After his move back to Regina, Semple contributed to television and music scores and appeared in the title role of Guitarman, a 1994 television movie. Semple also commenced a solo recording career that has resulted in the release of ten albums. In 1992, Semple came to national prominence through winning the MuchMusic "Guitar Wars" contest. Semple has been twice nominated, in 1999 and 2000, for a Gemini Award for his soundtrack work on the television series Incredible Story Studio. Semple won a Juno award in 1991 for best roots recording. He has won two Western Canadian music awards for "Qu'Appelle" and "In the Blue Light". 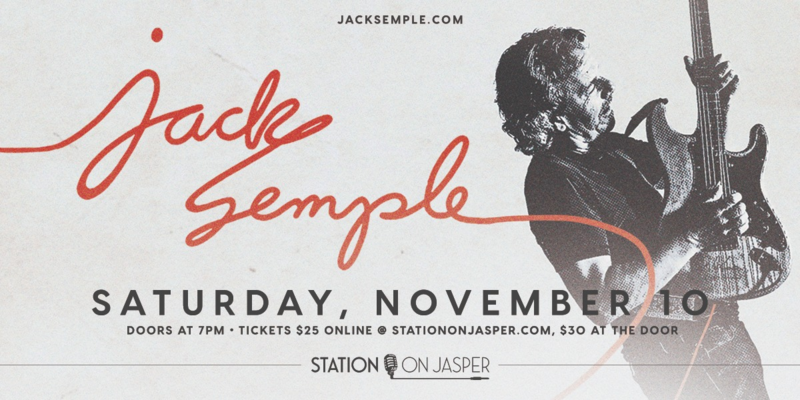 Semple continues to perform as a solo artist and with The Jack Semple Band, across Canada and now being championed across America!